Ms. Darlene Neilsen entered the world of adult education in 1999 as an office clerk for Banning Community Adult School. In 2001, she was promoted to office manager and worked closely with numerous administrators to operate the school. Darlene started teaching business classes including computer operations at Harbor Occupational Center in 2005. With her help, DACE has thrived despite the many changes adult education has gone through these past few years. In 2012, Darlene was the recipient of the E. Manfred Evans, presented to teachers and administrators within the Los Angeles Metropolitan Section. Darlene’s ability to organize information and systematize procedures are some of her finest contributions to the field. Darlene was successful in developing collaborative efforts to partner with other professional organizations (CAROC/P and ACESF) within the LAUSD Division of Adult and Career Education area and provide professional development and fundraising activities that benefited the LA Metropolitan stakeholders. Darlene Neilsen began her CCAE service in 2000 as the site representative for Banning-Carson Community Adult School. She volunteered her time to help with their awards dinners and section conference committees and then held the position of secretary and treasurer for the South Chapter. Darlene is widely known to be a highly efficient and organized person. She has the uncanny ability to oversee, supervise, and complete projects on time, all while balancing her family life, regular work, and CCAE commitments. 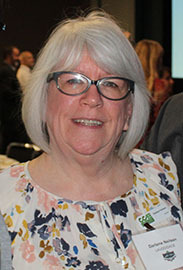 Darlene’s continuous service and leadership at CCAE LAM Section eventually led to her election into the positions of secretary, vice president, president elect and president in 2008-09. Darlene’s dedication to CCAE’s mission and goal has been solid and unwavering. She served as the state awards chair from 2009-2013. Darlene nurtured and developed many members of the CCAE LAM Section through mentoring opportunities during her long, active career as a CCAE member. She is fondly known as a mother figure by members of the CCAE LAM Section.